Alistair Spalding hosts a discussion between the four choreographers in the epic new Sadler’s Wells production. The artists will discuss their approaches to Adès music and how the music was selected, as well as the considerations of creating dance for Adès distinctive style of contemporary composition. Free to same day ticket-holders. BSL-interpreted. Enhance your evening’s experience at Sadler’s Wells with our Eat & Seat package. Avoid the queues at the bar in your own exclusive seating area, with food and drink before the show, all in the comfort of the theatre. All for just £25 per person (excludes show ticket). Package available at Sadler's Wells shows only. Please note the Eat & Seat package is only available for evening shows. Packages must be booked no later than three working days prior to the booking date. Standard Sadler's Wells T&Cs also apply. Sadler's Wells is a unique and exciting venue for your corporate or private entertaining. Enjoy our exclusive and modern Pina Bausch Room for a private pre-show and interval drinks reception, combined with tickets for Thomas Adès: See the Music, Hear the Dance. The Pina Bausch Room must be booked out in its entirety with a minimum of 10 guests per show. 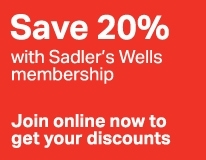 Find more classes, talks and special events in Sadler's Wells Extras.